The master's in Systems Engineering Management brings extraordinary value to professionals who are looking to better understand a technical organization structure from a systems perspective. Systems thinking is invaluable these days. That's why this program prepares its graduates in applying a critical systems approach to complex problems. 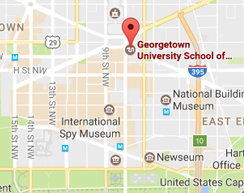 Georgetown's program produces professionals who contribute to the engineering profession and to society, all while satisfying their personal goals of having stimulating and rewarding careers. I look forward to welcoming you to the Georgetown University community and guiding you through this phase in your professional endeavors.